Lowestoft, United Kingdom. (March 1st, 2016) – Nexen Lift Trucks Ltd has today, launched the latest editions to its premium “X” range series. The new FBXT/FBX 3 & 4 wheel electric machines are available in 1600-2000kg capacity in both long and short wheel base. All models offer the very latest technological advancements in the material handling industry. Built to the highest exacting standards utilising premium quality components, which together with the signature Nexen “X” range fully floating cabin design provides exceptional operator comfort with superior ergonomics which dramatically reduces driver fatigue. The complete range incorporates high capacity DIN-STD batteries for multiple shift operations with fast & easy side entry battery removal. In pre-launch application tests the trucks exceeded all design expectations, for stability, reliability, driver comfort, performance and energy efficiency. The new electric-powered “X” range series trucks have been designed like all Nexen models with high emphasis on ease of maintenance. They feature class leading accessibility to all serviceable parts, including the complete control panel which is removable in less than 2 minutes. Nexen will be offering an industry unique service exchange programme to ensure any downtime is kept to the absolute minimum. To further enhance accessibility there is an optional fully tilting cabin feature. The FBXT and FBX machines feature regenerative braking promoting longer battery life, and much improved energy efficiency. The automatic parking brake ensures no adjustments are required, again reducing equipment maintenance requirements. Nexen worked very closely with the Curtis Wright Corporation whose new rotary position sensor has been specified for use on Nexen’s British-designed and manufactured forklift trucks using a Nexen purpose-designed steering axle. Both three and four wheel models benefit from bespoke versions of Curtis Wright’s sensors, which are being used to detect steering, position and direction. The feedback from the sensor is then displayed to the operator via the on-board diagnostic display, thus the outputs can enter into safe pre-defined status should an internal sensor error be detected. 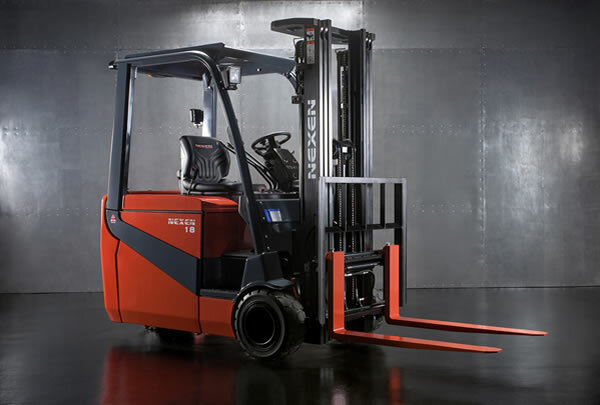 These electric models are the latest in the Nexen line-up of counterbalanced forklift trucks and have been specifically designed for the logistics and warehousing sector, whilst also being developed to apply the most advanced technology and versatility available. The three- and four-wheel variants allow for a range of applications with load capacities ranging from 1.6 to 2 tonnes with multiple configurations such as EPS, Hydraulic steering and other options available. The research, design, development and production of these machines was undertaken at its European Headquarters. Nexen then took the decision to use its UK facilities rather than those it controls in Taiwan as part of its continuing expansion plans for it’s UK manufacturing facility. This decision allowed Nexen to place the design and production in the hands of some of Britain’s top designers and engineers. Nexen expects the latest additions of the “X” Range family to be extremely successful in the World Market, with their already strong international dealer network placing forward orders earlier this year. The Global need for reduced environmental impact of it’s carbon footprint is leading to many traditional IC applications being forced to change to electric power. However due to the high-duty cycles these traditional IC applications require any electric machine still has to provide similar high performance and high productivity, The FBXT and FBX product range has the technology together with the highest combination of performance, productivity and cost effectiveness to achieve this whilst not compromising operator comfort and safety.